This has been available for awhile but I just realized that I never published it on this website. Anyway…. The 3D Object Sequencer Suite is a Vixen AddIn and a Vixen Plugin which will aid in sequencing 3d objects for your display. I suppose the most common 3D object people generally use is the 3D skull. This version is basically a rewrite of the Skull Sequencer series with some tweaks and one huge new feature: You can now create your own 3D objects to use with the Suite! The release includes a 3 Axis Skull and a Snowman object. This is just a test post to check if I can change the order of posts on a page. If I can do this I’m going to consider using WordPress instead of Joomla in the future. This site is simply a place for me to consolidate projects I’m working on or completed as well as a location for me to keep track of all my files. Feel free to browse around and let me know if there’s anything you’re interested in or if you have any suggestions for improvements. I’m using WordPress for this site. As of today I’m extremely new to it so pardon the appearance of the site. Hopefully it won’t take me too long to get everything the way I want it. The information and downloads on this site are provided free for you to use for personal use only. All information/download comes with no warranty, guarantees or promises of any kind, expressed or implied. The Author is not liable in any event for incidental or consequential damages in connection with, or arising out of, the furnishing, performance or use of any information. Transistors: base resistor selection for saturation state. Need to know Maximum current load for the device to be turned on. Need to know minimum HFE for transistor. Add 30% to the minimum base current to be sure the transistor is saturated. Use R = V/I to calculate base resistor. The Skull Sequencer AddIn has been updated to work on both 32 and 64 bit systems. In order to do this I had to use SlimDX instead of DirectX. All the information you need is included in the the zip file in the download section. 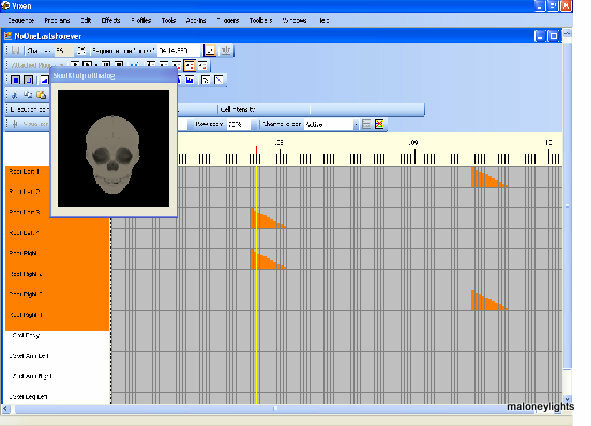 Here is a sneak preview of my Skull Ouput plugin for Vixen. Will not work within a program. You need to disable it in the profile. Here is the first in a series of tutorials I wrote to help beginners get started with programming custom tutorials for Vixen. It is meant as an introduction geared towards non-programmers. There are 15 parts to the tutorial, all can be viewed on YouTube.